I'm continually amazed by the creativity displayed by people in this hobby, the out of the box paint jobs, conversions, scratch builds and pop culture references I see on blogs and forums blow my mind. It almost makes me feel a bit dull just wanting to recreate the studio armies seen in White Dwarf and the books...almost. I have a couple of projects that I plan on doing my own thing with, but what dragged me back into collecting and painting again in 09 was the idea that I would recreate the two armies from "The Fangs Of The Wolf" battle report, which was originally published in WD# 158 but was more familiar to me from it's appearance in the Space Wolf codex- and I do mean familiar because I studied and reread that battle report many, many times over the years! 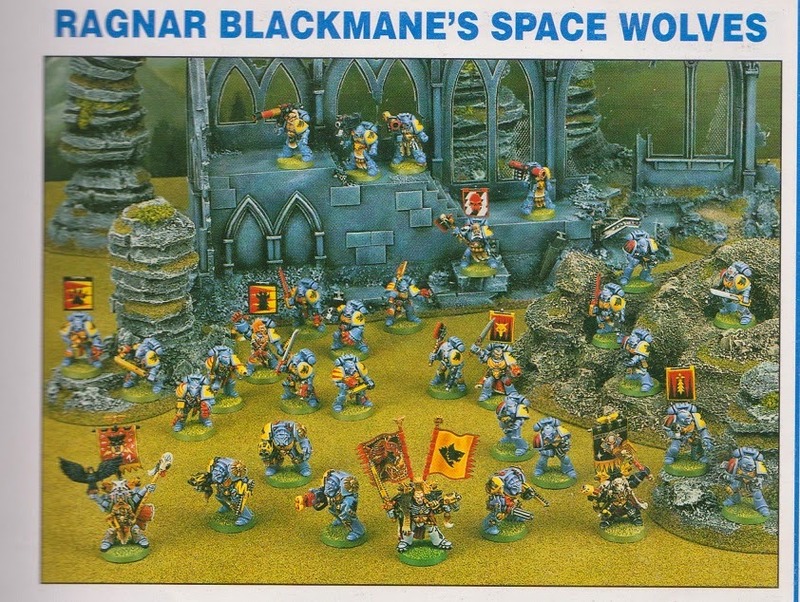 Ably commanded by Andy Chambers in the report, this army was the bees knees to me back in 93 and although they weren't painted I had managed to collect the majority of it by the time I initially dropped out of 40K and miniatures etc somewhere around 97. The rest ( and much much more) was picked up via ebay this second time around. 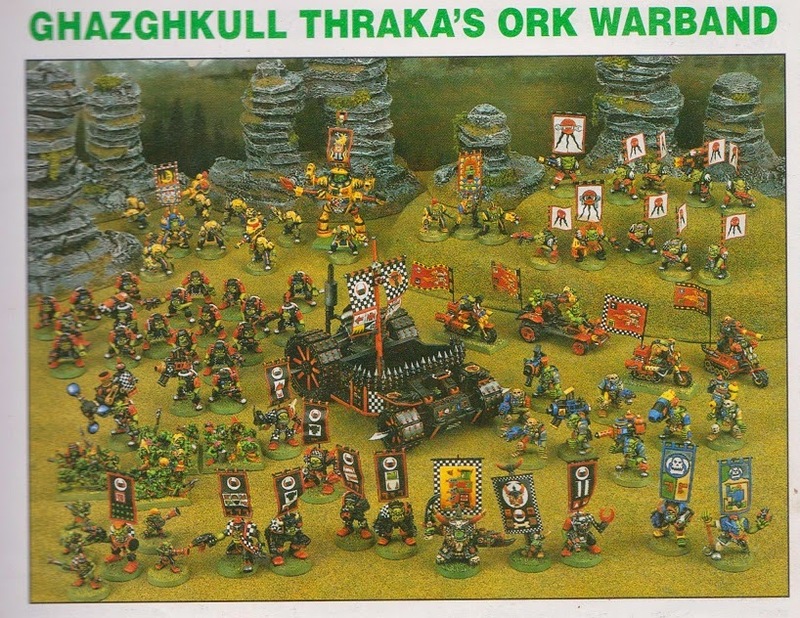 And the opposing Ork warband, commanded by Jervis Johnson as Ghazghkull Mag Uruk Thraka. My version of this won't be a carbon copy but will be pretty close. Now when I got my first White Dwarf magazine, it was issue # 166. All I had was a few Heroquest minis and Space Crusade at the time, and had only discovered the magazine and the larger world of 40K and the other games the previous week when I had read through a big stack of WD's on a holiday at my Brother's place. 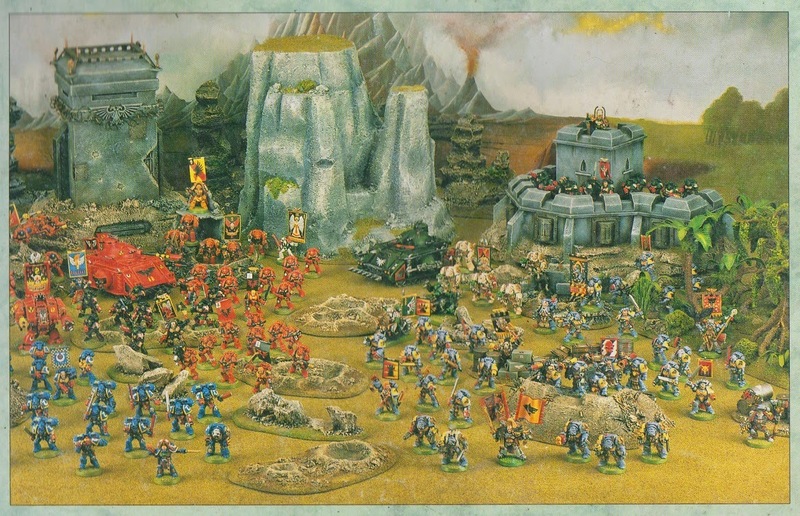 The free plastic Marine Sergeant that came with it featured in my last post, and the battle report contained within it's pages was another Chambers V Johnson grudgematch, "Angels Of Death"
This is what I think of when I hear the words "Space Marine Army". Getting this lot painted is my priority at the moment! As you may well know, this is the battle report where Andy's "Brother Captain Erasmus Tycho" was slain by Jervis' Weirdboy, giving birth to the Tycho special character and mini. 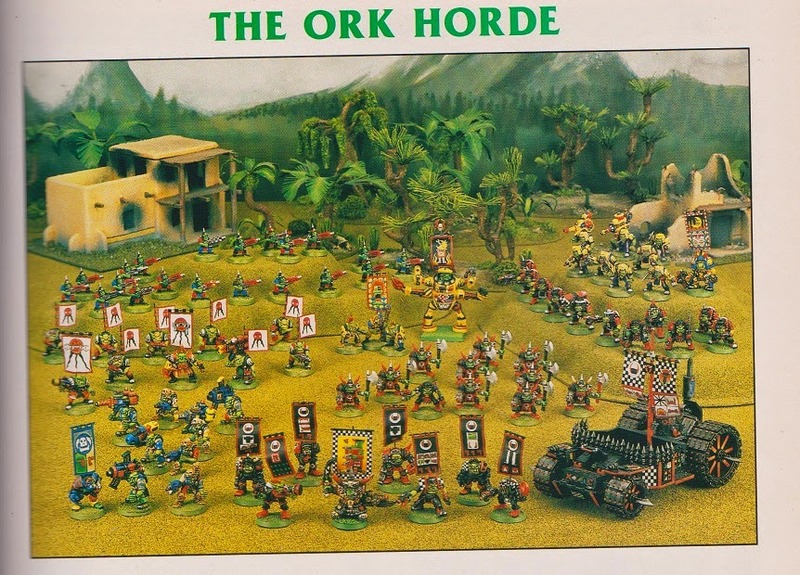 The Orks, mostly the same models as in the Fangs Of The Wolf battle, with the plastic Goffs and Gretchin making an appearance. This seemed like a HUGE army back then! To my credit I've restrained myself from collecting Ultramarines and Dark Angels. Hope you have enjoyed my nostalgic ramblings and the pretty pictures! Argh I wrote out a reply to this and then the interwebz ate it! 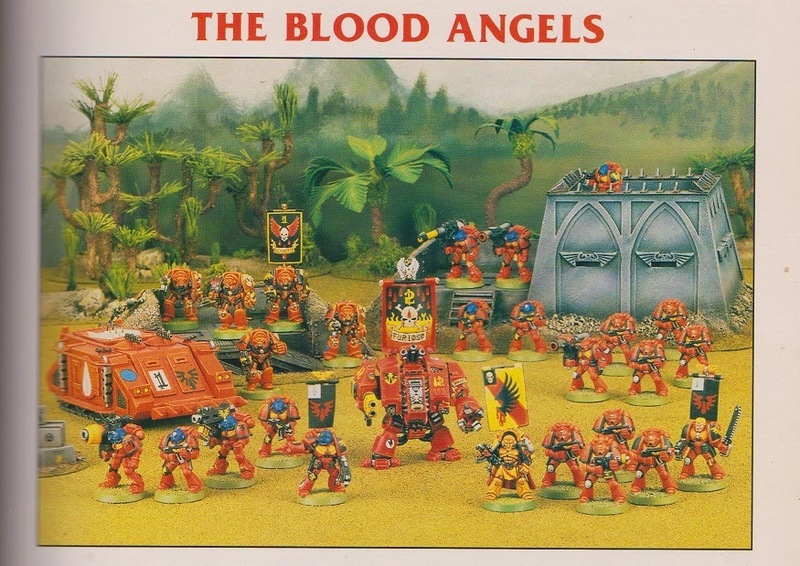 Just to say I used to love looking at these in the 2nd edition books, and there was a very cool alliance of Blood Angels and Dark Angels that I thought was pretty awesome. Come to think of it, it used two of my favourite models: the Dark and Blood Angel captains. The good old days hey? Ugh, I've written insightful comments and then had them wiped when it turns out I wasn't signed in with my account, somehow. My first White Dwarf was 145, but I remember both these battle reports, and re-reading them over and over again. For what it's worth, I take a lot of inspiration from you BB, not just from your paint work, but also, your drive and dedication to your projects. I can never seem to focus long enough on anything to see it through without some kind of looming deadline... :s keep up the good fight soldier!